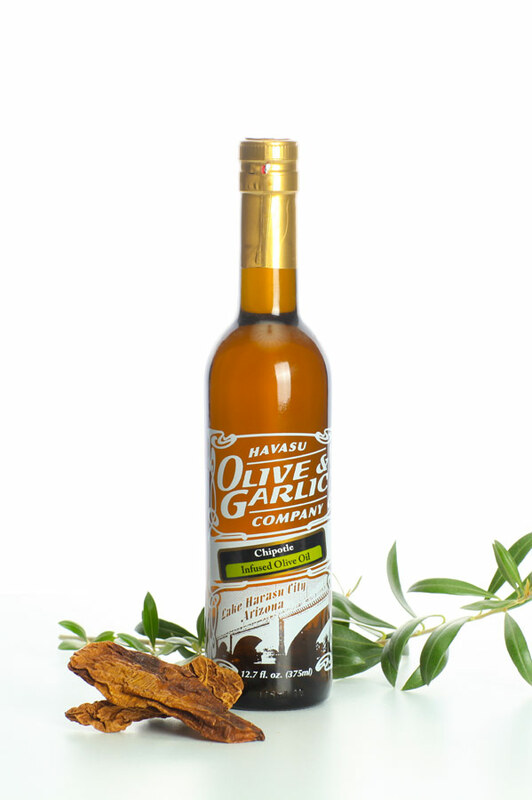 Product code: Chipotle Infused Olive Oil Category: Infused Olive Oil. Smokey flavor, great for marinating steaks, brushing on grilled chicken or seafood. Excellent dipping oil for artisan breads, finishing oil for soups, pasta or grain dishes and a wonderful base for dressings and marinades. The rich, smoky flavor hits you at the end as a touch of heat kicks into gear to impart an after burst of bite. Brilliant in Mexican and other Latin cuisines; ideal for grilling meats and corn on the cob. For a refreshing barbeque sauce with a little zing, pair it with some of our balsamic vinegars like tangerine, fig, or red apple. It can even be used in baking, and adds a spicy surprise to cornbread. Garlic Friends and Garlic Fiends alike will appreciate this strong flavor of garlic with a heady warmth and smoothness – this is the aroma of Papa Stapes’ kitchen! As an everyday oil look to use on everything from pastas to salads. Incorporate into burger meat before fashioning patties. Add salt and pepper for a simple rich sauce, or knock your popcorn outta da park! Drizzle on a crusty loaf topped with fresh garlic and Kalamata Olives. Pair well with any Balsamic Vinegar but we love it with our Black Mission Fig Balsamic. Highly aromatic and vibrant, dill is a must-have Mediterranean staple. We recommend using it in dressings, marinades, with cucumbers, chopped salads, and spinach, fish, poultry, meat, in soups, egg dishes, creamy sauces, aioli, for making tartar sauce, potato salad, with vegetable. It pairs beautifully with the Sicilian Lemon Balsamic, Traditional Style Balsamic, Pomegranate Balsamic, and Champagne Vinegar. Delicious combination of fresh herbaceous sage paired with an array of savory wild mushrooms. Try drizzled over cream of mushroom soup, on risotto, stuffing and aioli. It makes an inspired vinaigrette when paired with our Sicilian Lemon White Balsamic Vinegar . This deliciously seasoned oil embodies all the best flavors of a traditional Thanksgiving dinner. Use this warm, cozy oil in your favorite comfort foods, from stews to stuffing to roasts. It's an ideal oil for southern cooking, and will give traditional dishes like biscuits and gravy a rich, earthy flavoring. This splendid Harissa Olive Oil is infused with the natural flavors of Piri Piri & Red Chili peppers, Serrano peppers, garlic, caraway and coriander. A perfect match for any North African, Moroccan and/or Middle Eastern dish. Adds a touch of spiciness to freshly made humus, couscous, soups, and lamb or poultry dishes. Pairs extremely well with our Sicilian Lemon White Balsamic Vinegar. “Il sapore d’Italia!” The taste of Italy! This is it, our #1 selling Olive Oil by far, bringing to forefront the pungent flavors evocative of the kitchens dotting the Tuscan countryside. The blending of garlic, rosemary, basil & sage imparts a classic Italian flair to ant dish, often the sole seasoning you would need. New cook or accomplished chef will appreciate this as a truly great everyday olive oil for every use from salads to pasta to baking to outrageous eggs in the morning. Pair with Pomegranate or Raspberry Balsamic Vinegar, sprinkle with grated Parmigiano Reggiano cheese and a few twists of freshly ground pepper for an irresistible bread dipper. Our Basil oil maintains a traditional taste that makes it a good cooking staple. It is a beautiful oil that adds depth and dimension to many dishes without overpowering them. An extremely versatile oil, this variety pairs excellently with our strawberry or raspberry balsamic for delicious vinaigrettes, and it makes a fine addition to pastas, pestos, bruschetta, meat marinades and stir fry. The sweet, warm taste of slow-roasted onions followed by the brightness of cilantro makes up this dazzling oil, which will remind you of hot, Havasu days and steak fajitas coming off Papa Stapes’ grill. This oil blend is a natural fit in southwestern cooking and for grilling meats, vegetables and fish. Add it to guacamole, or on roasted corn for an extra kick of seasoning, or drizzle on garlic bread for an Arizona layer of flavor. This creamy olive oil is naturally infused with the rich flavor of butter. Use this golden, vegetarian, dairy free olive oil as a butter substitute in baking or anywhere you might use melted butter including: over hot popcorn, with seafood i.e. crab or shrimp, to dip bread in, over pasta, mashed potatoes, or rice. Classically French! Notes of rosemary, fennel, basil, thyme and bay leaf; our all natural Herbs de Provence is a show stopper when drizzled on chicken, rubbed on turkey before roasting, for bread dipping and aioli. This oil is produced by pressing whole limes together with the olives at harvest. A light and refreshing flavor of citrus with a wonderful fragrance that walks the line between sweet and tart without being overpowering. Starts with the taste of honeyed lime and finishes with a kick of acidity bringing a note of refreshment to many cuisines. Versatile while not as strong as some other Italian oils, can achieve a variety of flavors depending on how it's used. It's excellent as a mild, citrusy vinaigrette, since it's not as sweet as lemon or bold as blood orange. For even more unique pairings, try it with our Sicilian Lemon White Balsamic for a candied citrus taste.